Have you ever heard about Skyrim? If you have not, what about Elder Scroll? Elder Scroll is truly one of the most famous Roll Playing Games (RPGs) in the world. Elder Scroll was released in fifth series until now, and Skyrim is the fifth of the series. Every series of Elder Scroll is related to each other and shares the same background. Elder Scroll 5 : Skyrim was released in November 12th, 2011 and the sales passed 20 million. Absolute autonomy and flexibility in playing this game made it distinctive and thus, popular. In Skyrim, nothing is mandatory. 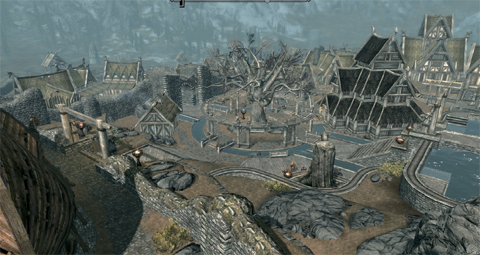 In the main stage of the game, a huge virtual world called Skyrim, you can buy a house or find a new route and earn money by honest labor or by theft. 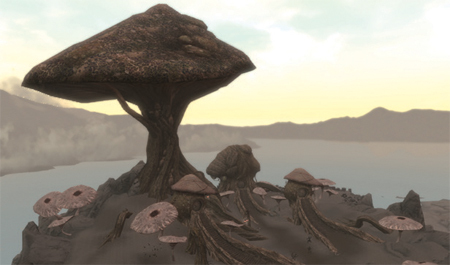 This world is the land of Nords which is one of the ten races that player can choose. 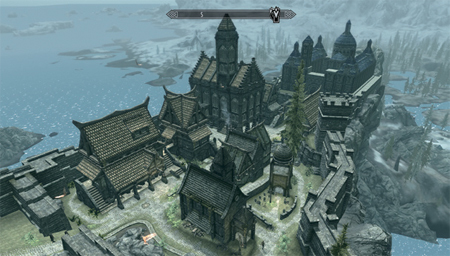 You can live in any eight cities: Whiterun, Mortal, Markas, Falkreath, Dawnstar, Winterhold, Winterhelm, and Riften or one capital called Solitude if you please. What we have to pay attention to is the main character, which is me, turned out to be a Dragonborn. 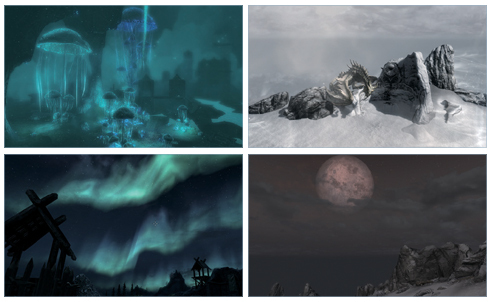 All stories of the game are started from this- new appearance of the dragonborn over thousands of years. 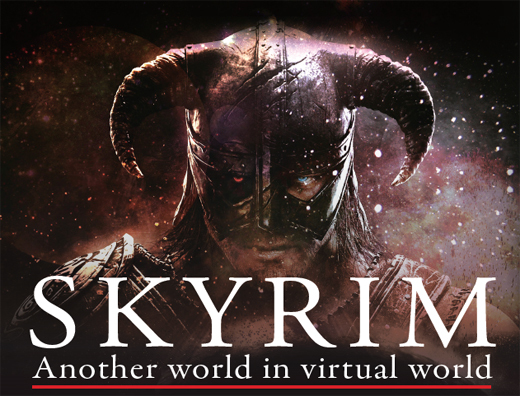 The cleverly-designed and sophisticated virtual world of Skyrim is interesting just in itself. However, the fact that it carries realities about people of the real world in its cyber space makes this game more intriguing and worth playing. The game begins at the execution ground. The falsely accused main character was about to be beheaded but the appearance of a dragon thousands of years ago saved his life by making the people chaotic. Now the whole game play is up to the player. There are hundreds of stories and quests that players can take. As a dragonborn, player can absorb souls of dead dragons and use their power. Following the old legend, only dragonborn can defeat Alduin and put an end to this disaster. Main character got trained and learned special tricks. Finally, the main character defeated Alduin. At first, the main character was even suspected as the culprit but eventually saved Skyrim. This character is a lot like Lee Sun-sin in a regard that they were once abandoned by his own group but fought against enemy to save his own land. Skyrim has been under the rule of Imperial. 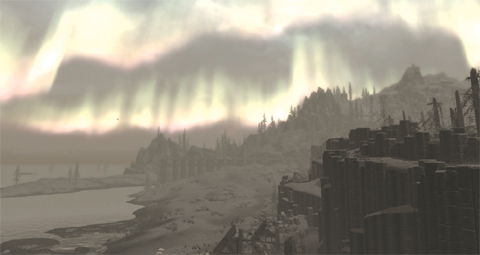 Imperial dominated several territories including Skyrim. Due to a poor operation, some regions declared and achieved independency. Following their footsteps, more movements from other regions to become independent from Imperial arose. Stormclock, with Ulfric as a center figure, is a representative independence army group. The player can choose Imperial’s side or Stormclock’s side. An unusual feature is Imperial proscribe Talos worship, which is a god to Skyrim natives. Game Skyrim somewhat resembles the real world. Proscribing other religiouns often happens over thousands of years in our world and aggressor nations often used strategies of forbidding native religions to make natives obedient. Another interesting thing is that racism exists in Skyrim, too, just like the real world. During the conversation with Stormclock NPC, I got the feeling Stormclock tends to prefer the Nords, the natives of Skyrim. Fortunately, there seems to be no sexual discrimination. In Skyrim, there are four guilds- Companion for warrior, Thief guild for thief, Dark brotherhood for assassin, and Winterhold college for magician. All four guilds have interesting stories but Thief guild caught my eyes. Thief guild was originated from Gallus the first guild master, Mercer Frey, and Kharliah. Early Thief guild was at the summit of its property. They swap money as much as they want. However, after the Gallus’s death, guild was declining, and Kharliah disappeared after being accused of his murder. The player joins the guild in this situation. As a rookie thief, the player takes trivial work at first. 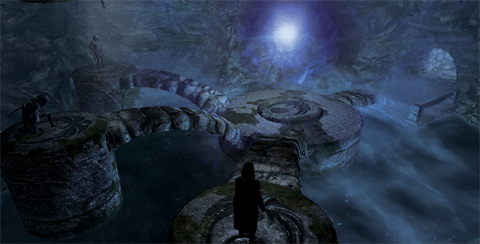 After receiving credits, the player is given an important mission related to the Kharliah. During the mission, a big secret is revealed. The real murderer of Gallus was Mercer Frey. Frey killed Gallus because he figured out Frey had opened the guild’s vault and stolen money with a legendary key which can open any lock in the world. Knowing the truth, the player defeats Mercer Frey together with Kharliah. Existence of the key which can open any lock in the world is thought-provoking to me. It is authority in itself and powerful weapon and most of people who get the power changed like Mercer Frey. Betrayal of organization caused by greed occurs often in real world as well. As always, criminals are supposed to be caught and get punished in both real world and the virtual world. Overall, Skyrim is much like our world except for, its supernatural asepcts. As mentioned above religious wars and racism exist. War for independence is common in the real world, even in our country Korea. The player can have marriages with NPC in a game. The wife of the player can go outside, make money, and cook for the player with no discriminations, but the player has to own a house to marry. That is cruel but even this trivial thing is just like the real world. Additionally, the player can adopt orphans. Skyrim is run based on a capitalist system, which is pretty surprising. This means the player can regard almost every event in terms of money. The player can bribe the city guards to commit inappropriate acts like assassinating someone or stealing something and can also buy mercenary soldiers as a company.